Refrigerators are the most used as well as the least troublesome of all electronic appliances. Refrigerators help in storing food items and eatables, so that they remain fresh for a longer period of time. They come in very handy when on a hot summer afternoon you want to enjoy a refreshing drink with some ice cubes. Almost every household in America owns a refrigerator. They come in different shapes and sizes. Also there are numerous brands that manufacture refrigerators and one can pick a fridge that fits ones requirements and budget. The various brands around the world that provide good quality refrigerators are Amana, Frigidaire, GE, Hotpoint, Jenn Air, Kitchen Aid, Maytag, Samsung, LG, etc. All said and done, one has to keep in mind that refrigerators have plenty of potential trouble areas too, which may cause regular refrigerator repair situations. It is a minor miracle of technology that they cause so few complaints for most users. Many people who have had nothing but complaints about their other appliances have never had refrigerator or freezer troubles. They won't be interested in what follows. But for those whose refrigerator is giving them trouble, read on! Replacing lights and light switches can be done by you, though an expert and experienced professional help is recommended. The door switch that controls the light is held either by a screw or a tension spring. In the latter case, it simply pulls out. But if you open the door and no lights come on, in a refrigerator with more than one light, you know that the problem is not in the switches or anything else inside the refrigerator, but in the power supply. If it has only one light, then it could be a burned out bulb. If you open the door and the light does come on, but the refrigerator doesn't work and the freezer compartment shows signs of melting, the problem may be in the motor or its switch. Always make sure when you are attempting to repair a refrigerator problem on your own, that you are not too close to the electric wiring. Electrocution or damage to the refrigerator circuitry are real possibilities. If you realize that there indeed is a problem with the fridge functioning, like the cooling is not effective, there are temperature fluctuations inside the fridge, the fridge shakes when power is on, the fridge leaks, the fridge is making unnatural and abnormal noises and creaks, etc., calling a refrigerator repair professional may be recommended. They are experienced enough to know what is wrong with your fridge and solve the problem. Chances are high that yours is a common problem and one that the refrigerator repair men have experience and expertise in handling. This will likely save you a lot of time, energy and stress. Though calling in a refrigerator repair technician is a later process, you must be able to know when there indeed is a major problem with your fridge. A rapid "click, click, click" sequence when the motor begins probably means a short circuit in the winding. Motor hum followed by a clicking noise also involves the winding (coil) of the motor. None of these problems can be repaired at home, but you will at least know what is involved. Also this will act as a signal for you to call up a refrigerator repair technician. When all else fails, and you need to have someone repair your refrigerator, call us at (506) 872-9956 or submit your request on the Contact Us page and we will have a refrigerator repairman contact you promptly to assist you with your problem. Our customers are our greatest asset and your recommendation to your friends is you’re your greatest compliment to us. 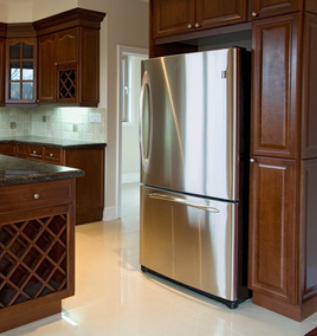 We are more than happy to answer any questions about refrigerator repairs that you might have. Your refrigerator is probably your most expensive appliance to purchase, and it can also be your most expensive appliance to own. 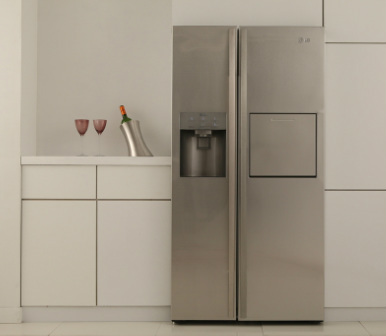 You refrigerator is about the only appliance that you own that runs non-stop. it is also the biggest consumer of energy that you own. Therefore, to keep your energy cost down, and to avoid having to replace that expensive appliance, it is essential that you take proper care of your refrigerator. The most important thing that needs to be done to keep your refrigerator running efficiently - and to simply keep it running - is to take good care of the coils. The coils on your refrigerator are located either in the rear of your refrigerator or on the bottom. These coils attract dust, and when they are covered with dust they have to work harder to maintain a cool temperature within the refrigerator. The harder they have to work, the higher your electricity bill will be. Cleaning these coils is quite simple. Simply pull your refrigerator away from the wall and then vacuum the dust off of them. The next thing that needs to be cleaned is the drip pan of the refrigerator. The drip pan is located beneath the refrigerator, and simply needs to be pulled out, emptied, and cleaned with soapy water. If you have an automatic defrost refrigerator, the water from the defrosting process flows out of a drain in the floor of the refrigerator and into the drip pan. The water remains there until it evaporates. Small particles of food can either flow through a tube to the drip pan or they can get caught in the tube and clog it. To clean the tube, simply stick a pipe cleaner into the tube and flush it with water. Do this before removing the drip pan so that the water is caught. Then, of course, remove the drip pan and clean it. The gaskets on your refrigerator seal the cold air in the refrigerator, and keep the warm air out. If proper care is taken of the gaskets, they should last the life of the refrigerator. All that is necessary to keep the gaskets in good shape is to wash them down with soapy water from time to time. Last but not least, if your refrigerator does not have automatic defrost, be sure to not let the frost in your freezer compartment get any deeper than a quarter of an inch. A refrigerator doesn't actually cool things, it removes the heat from them. But then you probably don't want a physics lesson. But you may wonder where the "cold" comes from. So here is a little bit more physics. When a gas goes from a state of high pressure to a state of low pressure, the temperature of the gas drops. Your refrigerator has a compressor and a closed system of tubing that contains a gas (the refrigerant). The compressor pumps the refrigerant and compresses it. The refrigerant flows through the coils on the back or under the refrigerator and through an expansion valve to the inside of the freezer. As the refrigerant passes through the expansion valve the pressure drops and so does the temperature. Inside the freezer a fan circulates air over the cool tubing and the refrigerant absorbs the heat from the freezer's relatively warmer air. If you prefer to just think of the fan blowing cold air into the appliance, that's fine, it all works out to pretty much the same results. But technically, the heat is being pumped out rather than the cold being pumped in. The cold air in most refrigerators, but not all, comes from the freezer. The cold air in the freezer passes through vents to the refrigerator. A thermostat in the refrigerator activates the compressor whenever the temperature rises above the set point on the temperature control. In some newer models there is a separate cooling coil for the freezer and the refrigerator and thus two temperature controls. As the air in the refrigerator cools, the water in the air (humidity) condenses. Water that condenses in the freezer will freeze into frost. Most modern refrigerators have an automatic defroster in the freezer which prevents the build up of frost. The defroster is simply a heating element that is controlled by a defrost timer and a thermostat. The water from the melted frost drains out of the refrigerator into a pan beneath the refrigerator and evaporates. A door switch closes a circuit when the door is opened and turns on the interior light. When the door is open some refrigerators will disable some components such as the fan, defrost heater or "through the door" ice and water dispensing. A common question we hear pertains to operating a refrigerator in the garage or other unheated space during cold weather. Bottom line, refrigerators and freezers don't cool efficeintly when operated at temperatures below, roughly, 7 degrees (C). The first reason is that the outside temperature may get low enough that the thermostat inside the refrigerator never gets warm enough to activate the compressor and so the freezer warms up to the outside temperature. Another problem is that if it gets too cold, the refrigerant pressure becomes too low to generate the necessary cold and so the freezer only chills down to the outside temperature.